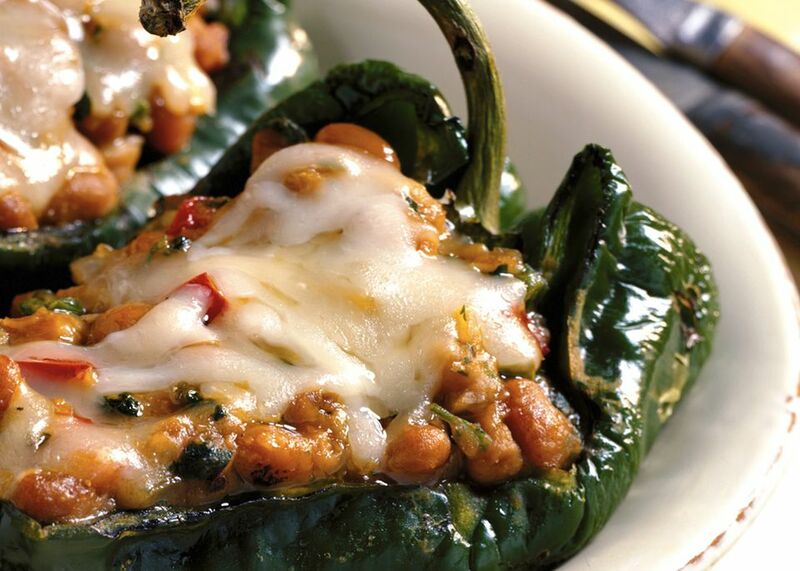 Vegetarian rrilled chile rellenos: Poblano peppers grilled and stuffed with cheese. This stuffed pepper recipe can be used to make either vegetarian Mexican chile rellenos using poblano peppers on the grill, or, if you don't have poblano peppers, you can stuff green bell peppers instead for a dish similar to traditional chile rellenos. These vegetarian chili rellenos are stuffed with a mixture of baked beans and cheese, seasoned with garlic, onion and fresh cilantro. Need your vegetarian chili rellenos to be lower in fat or completely ​vegan as well as vegetarian? To keep it vegan, simply omit the cheese. Need it to e gluten-free as well? All of the ingredients in this recipe are gluten-free, with the possible exception of the canned baked beans. Read the label carefully, as some brands contain hidden gluten-containing additives. If you're not sure and cooking for someone else, probably best to err on the side of caution. Recipe courtesy of Bush's® Beans. Cut poblano chiles in half lengthwise to create a boat for filling and scrape out seeds. Heat 2 tablespoons olive oil in a nonstick skillet. Add onion, garlic, jalapenos, red bell pepper, cilantro and cumin, and cook over medium heat until golden brown for about 4 minutes. Remove pan from heat and stir in the baked beans, hot sauce and 8 ounces of cheese. Add a bit of salt and pepper to taste. Spoon the mixture into the hollowed chiles and sprinkle with remaining cheese. Set up your grill for indirect grilling and preheat to medium. Arrange the chilies on the grill away from the direct heat. Cook until the chilies are tender and cheese is browned and bubbling about 30 to 40 minutes. Remove from grill and serve at once.